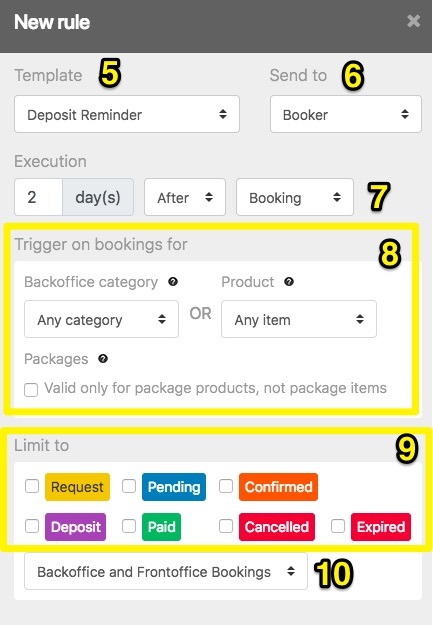 The rules module can set automated and pre-defined emails, based on different conditions and settings of a booking. In this module, you can adjust which email is sent depending on a booking status, product or action taken. 1. Go to the Settings module. 4. Click on Add a Rule. A box to the right will appear where you can configure the rule settings. 5. Chose an email template that you want to apply a rule to. 6. You can send this email to bookers or to a specific staff member. 7. In the trigger section, you can choose the exact moment you want to send this email. 8. You can opt to send out this email to all the bookings you receive (any category + any item), or only when users book a specific product(s). You can also define whether the email should be sent out for the whole package and not all package items. 9. In the conditions section, you can set a specific booking status to receive this email. 10. To finish the rules setup, chose if you want to send out this email when receiving frontoffice bookings or to both backoffice and frontoffice bookings. From which e-mail address are my outgoing e-mails sent? The sender email address for automated emails and rules is by default the same email address that is configured for the Bookinglayer account. This email address can be changed. Please contact our support team. It is not possible to set different sender email addresses for your automated emails. In case you want to change the domain part of the email address, please check your DNS settings in order to prevent that the emails go to spam folder. For further information about DNS settings , please see this article.